There’s a new kid in town. Jay Powell’s first major speech as Chair of the Federal Reserve, the Monetary Policy Report to Congress, had an immediate impact on markets, interpretated as indicating a more hawkish stance than his predecessor. Time will tell but one interesting feature of his speech was his emphasis on monetary rules in setting policy, which he finds ‘helpful’, with an analysis of five such rules detailed in the Report. It seems clear that the Fed do not slavishly follow any rigid precription in setting interest rates, although the rate paths implied by the various rules are apparently set out ahead of FOMC meetings in order to act as a guide, and Powell’s speech is likely to stimulate further market interest in this area. The best known rule is named after John Taylor , and posits that the Fed funds rate should move by precribed amounts from its long run equilibrium level ( which on current FOMC forecasts is 2.75%) if inflation differs from the 2% target or if the real economy has moved away from its full employment level, which the Fed currently believes is consistent with an unemployment rate of 4.6%. What does the Taylor rule imply now? The Fed expect inflation in 2018 to pick up to 1.9% but that the unemployment rate by the final quarter of the year will have fallen to 3.9% and so below the long-run equilbrium level , indicating that tighter policy is required, with an implied Fed funds rate of 3.3%, which is around 1% higher than the median FOMC expectation as set out in the ‘Dot Plot’. 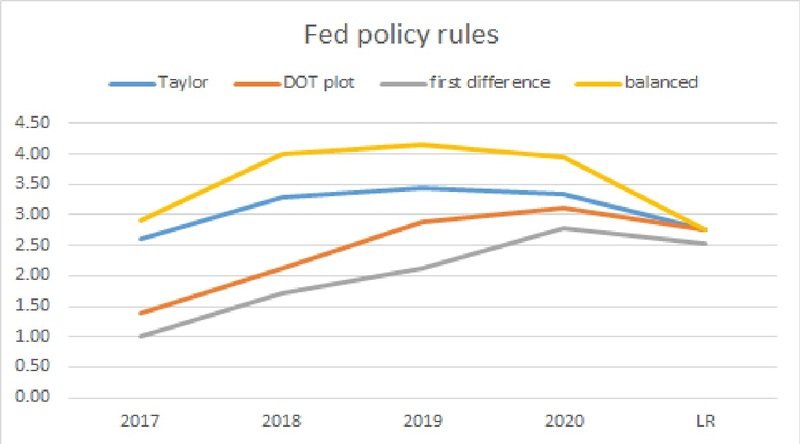 In other words rates would rise more rapidly than curently envisaged by the market , although over the following few years the ‘Dot Plot’ converges to the Taylor rule, albeit with the latter implying a modest easing of policy while the former points to a steady tightening. The Taylor rule also implied the need for negative rates following the financial crash and an “Adjusted Taylor rule’ take account of this insufficient monetary accommodation in the past by advocating a gradual return to the rate implied by an unadjusted Taylor rule, although the former has now largely converged to the latter. What of the other rules discussed? A ‘balanced Approach’ rule gives a greater weight to deviations from full employment and that also indicates that policy is too accommodative, and indeed should be much tighter by end-year, with a Fed funds rate of 4%, before falling back to 2.75% in the long run. Not all rules imply the Fed is behind the curve, however, with the other two rules discussed arguing against aggressive tightening. One, the ‘First Difference rule’ takes account of the current level of the Fed funds rate and the pace at which unemployment is changing, and implies a policy rate of 1.75% by end-year, which is below the ‘Dot Plot’ figure . Similarly, another variant, ‘the ‘Price Level rule’, implies that policy is also too tight now and as projected because the rule adjusts for the fact that inflation has been below the 2% target for some time, so the price level is therefore lower than would be the case had inflation been at 2% every year. All such rules are based on simplified models of complex and changing dynamics in the US economy, but ,as Powell noted, can be useful for policy makers . Three of the five imply that rates are too low given the Fed’s expectations for inflation and unemployment which may prove more significant with Powell at the helm. Central Banks set short term interest rates and can influence longer term rates but the market is in control of the latter and determines financial conditions in general. At times, financial conditions can move in the opposite direction to the stance of monetary policy, and we have a good example of that playing out now in the US. The Federal Reserve has tightened policy and has signalled this process will continue; the Fed Funds rate target is currently 1% higher than it was eighteen months ago, following four rate increases, and the FOMC expects conditions to evolve that will ‘ warrant gradual increases‘ over time. Furthermore, the Fed’s Balance sheet will start to shrink ‘relatively soon’, as the Central Bank stops reinvesting some of the bonds purchased under QE. Yet the market is currently giving a 60% probability to rates being unchanged by year end, and broader financial conditions are now looser than they were when the Fed started to tighten. Indeed, financial conditions in the US have rarely been easier, according to The Chicago Fed’s Financial Conditions Index. This uses over 100 financial variables (including the exchange rate, equity market volatility, credit spreads and the yield curve) to derive a weekly snapshot of risk, liquidity and leverage in the US. It is clear that the Fed is therefore at odds with the market; the former believes it is time to tighen policy, albeit gradually, while the latter acts as if the economy does not need such medicine.Moreover, some FOMC members have voiced concern that loose financial conditions carry risks for financial stability and increase the chances of a sharp correction in asset prices. Why is the market shrugging? Unemployment is very low and is around what many think of as full employment, but inflation remains stubbornly below the Fed’s 2% target, and has eased in recent months. The economy is growing but at a modest pace ( 0.9% over the first half of 2017) and the market may well believe that inflation will stay low for structural reasons, contrary to the Fed view of a gradual pick up to target. Does this divergence matter? After all, official rates may be higher but policy remains accommodative ( the real Fed Funds rate is still negative) and it may well be that financial conditions may indeed move if rates do rise steadily from here, as indicated by Fed projections. If not, the Fed may have to raise rates more aggressively if it wants to secure a tightening in financial conditions overall. An inflation shock would change things but for the moment at least markets simply do not believe that the Central Bank needs to tighten as much as the Fed itself thinks. One of them is wrong. The decision by the US Federal Reserve to leave monetary policy unchanged at the recent FOMC meeting was interesting on a number of fronts, including the emphasis given to the global situation in informing the outcome. OF more significance was the economic forecasts supplied by the 17 Fed members in confirming a trend evident for some time- the US Central Bank, like other policy makers across the world, has become increasingly gloomy about the medium term outlook for growth, and as a corollary expects interest rates to remain much lower than generally seen in the post-war era. That view has been around markets and academia for a while but it now seems to have permeated official thinking in a serious way. Secular Stagnation is the thesis that growth in the medium term will be weaker than we have become accustomed to, certainly in the developed world and possibly also in many parts of the developing world. Labour force growth has slowed in the West and in some cases is already falling, which reduces potential GDP growth, but a feature of the stagnation view is an emphasis on the savings/ investment balance. Ben Bernanke was one of the more prominent economists drawing attention to global excess savings, which he saw as putting downward pressure on interest rates and sought to link this to the observed trend decline in longer term bond yields in the US, the closest approximation to a global risk free rate of interest. More recently, others have drawn attention to investment spending, which is weak by historical standards, which is put down to a number of factors, including changing technology ( the capital spending generated by the internet versus railways or electricity for example) or simply a perceived decline by companies in profitable investment opportunities. Capital spending by governments, once the mainstay of Keynesian expansionary fiscal policy, has also fallen foul of the new orthodoxy , which extolls retrenchment. The result of this combination of higher savings and lower investment demand is a decline in the equilibrium real rate of interest. Indeed, some argue, like Larry Summers, that the equilibrium real rate may now be negative. With nominal rates now at the zero bound the only way to get negative real rates is to generate some inflation but so far policy makers have not succeeded in that aim, with inflation closer to zero than to official targets in many economies. Indeed, with deflation in some cases, real rates are positive. Given that background it is interesting to observe the evolution of the Fed’s thinking over the past few years. The long term rate of US GDP growth, which used to be thought of as around 2.7%, is now put at only 2% in the latest Fed projections, although that is still deemed consistent with inflation picking up to the 2% target. The forecast Fed funds rate ( the Dot Plot) in the long term has also fallen, to 3.5% from around 4% a few years ago, which implies a 1.5% equilibrium real Fed Funds rate( 3.5% nominal less 2% inflation). The Fed’s view on the timing in reaching this target has also changed appreciably; a year ago the median expectation was a Fed Funds rate of 1.375% by the end of 2015 and that is now 0.375% (with only two meetings remaining this year). Similarly, the current median expectation for official rates at end-16 is 1.375% against 2.875% twelve months ago. What is also striking is the distribution of the forecasts for next year, with a range of -0.125% to 2.875%. Equity markets did not react well to the FOMC leaving rates on hold, which implies that it is the Fed’s nervousness about the short-term outlook that is dampening investor spirits, offsetting any positives from the absence of tightening. The Fed’s gloomier longer term view is perhaps more significant , however, in that we are all Secular Stagnationists now it would seem. It is a long time since the US Federal Reserve last raised rates ( in June 2006, from 5% to 5.25%) and one has to go back over a decade to find the start of a tightening cycle (in June 2004, from 1% to 1.25%).Consequently there are many in the financial markets who have never experienced a period of rising interest rates although that may be about to change, judging by rate expectations; the Fed Funds rate is currently trading at 0.12% ( the Fed’s target is 0-0.25%) and the futures market is pricing in a strong probability of a rate rise over the late-summer and autumn this year. Of course the Fed itself has also changed tack in terms of monetary policy, in response to the improvement in the real economy, including strong employment growth and a decline in the unemployment rate. Consequently the FOMC terminated its asset purchase programme last year and has now dropped its forward guidance on rates, indicating that the decision will now be data dependent. That does not mean that a rate rise is inevitable ( some FOMC members are worried that inflation is low and may not pick up as anticipated) and the exact timing is clearly debateable, but what is interesting is the divergence between the market’s rate expecations over the next few years and that indicated by the published views of the FOMC. We can use such a model to project the Feds fund rate implied by the latest forecast made by the FOMC members(based on the central tendency). That envisages the unemployment rate falling to 5.25% by the fourth quarter of 2015, and as such around the Fed’s idea of full employment ( an unemployment rate between 5.2% and 5.5%). The FOMC expects inflation ( at 1.3%) to remain below target this year but to move up to just under 2% by 2017, and based on those forecasts the Taylor rule implies a Fed funds rate of 2.9% at end-15, 3.9% at end-16 and 4% in 2017. Indeed, the rule indicates that Fed policy should have been much tighter at the end of last year ( around 2%) . The severity of the Great Recession and the sluggish nature of the economy have persuaded central bankers that this time is different, however, and Janet Yellen, in a speech in June 2012 * put forward reasons why policy should remain looser for longer and discussed two alternatives to the Taylor rule as outlined above. The first , a Balanced rule, doubled the weight on the unemployment variable. This did imply a different rate trajectory given the level of unemployment at that time but such a model now shows little difference from the basic Taylor rule, because the unemployment rate is so close to full employment- the path of the Fed funds rate is virtually identical in the two models. Yellen went on the put forward a third approach – optimal control. This involves using a range of Fed funds rate in a model of the US economy in order to minimize a loss function, with the latter set in terms of the deviation of unemployment and inflation from target levels. That approach did imply a longer period of zero rates and a slower tightening cycle, albeit also rising to around 4% in the medium term. We do not know what that optimal control approach states now but based on the charts published in the Yellen paper it may imply a Fed funds rate of 1.25% by end-15 and 3% by end-16. The Fed will not slavishly follow any model in setting policy and the data may disappoint but what is striking is the divergence between market rates and that implied by any of the three models if the fed ‘s economic forecasts are broadly right. For example, 3- year bond yields are currently trading at 1% with the 2-year at 0.63%, which implies a 1-year rate in two years time of 1.7%. If the market is wrong in its implied pessimism on inflation and growth there is a very big bond market accident waiting to happen.